Sports fans and lovers are always gung-ho about staying connected to live football matches to revel in watching their favorite teams and players performing on the field. They want to have all sports updates and latest results of fixtures on the go. In today’s’ technology-rich world, enjoying all these facilities is quite easy on your Android smartphones. And what’s the best part? They are free of charge. With these latest football-streaming Android apps, you can also conveniently watch videos from any parts of the world, whenever you wish. All that’s required is a reliable Internet network and your handy smartphone or tab within easy reach. Let’s now explore the features and perks of the 10 best Android apps to watch football matches for free. Important Note: A number of these programs, while genuine, are not available on the Play Store. For this reason, you should enable installation from unknown sources on your phone by heading to Settings > Security and tapping Unknown Sources. This software is among the most widely used apps for streaming live sports shows, live TV shows, movies, and TV series for Android smartphones and tablets. Live NetTV hosts over 720 channels from a lot of countries around the world, including the likes of the UK, the USA, India, Middle Eastern Countries, Iran, Turkey, Pakistan, and many others. It offers you high-quality lives TV streaming, has Chromecast support, and provides VOD for movies. The Live NetTV app comes with a very clean, easy-to-use interface with various genres categorized for your convenient access. With Live NetTV, you can watch any live sports of your choice from any part of the globe, 100% free. It works well with phones running Android 4.1 and above, and you can download it from the official website. Mobdro is your one-stop destination for live TV stream, grouped into genres that include Sports, Movies, Entertainment, Tech, Music, Gaming, Animals, Anime, and Spiritual. Furthermore, it’s among the most popular live TV apps for the Android operating system. This program gives you access to live TV in over 12 various languages from over 32 different countries. Also, it is home to popularly watched TV shows that you can download for free, thus offering you a rich variety of content to choose from. The app is easily accessible and supports Android v4.1 and above. Show Sports TV app is a dedicated sports piece of software, which is ideal for enjoying your favourite football matches on Android-powered devices on the move. The app comes with a fascinating array of tailored channels from various parts of the world. It is a much-recommended application for every sports lover because it operates with minimum buffer and provides quality HD support. Show Sport TV even lets you chat with friends and acquaintances to share your thoughts on a football match and has a built-in video player. On this app, there are channels aplenty, including Sky Sports, beIN Sports, Star Sports, Fox Sports, Sony Ten, AD Sports, BT Sports, WWE Network, Sports Klub, Sports Net, among several others. Developed by Sony, this program is an ultimate sports app for watching and following the live football games right on your Android smartphone or tablet. 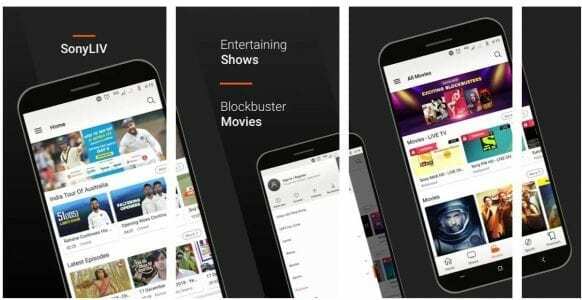 With Sony LIV app, you can stream and download matches played in Cricket, UEFA, EPL, La Liga, The FA Cup, FIFA World Cup, Italian Serie A, Copa América, WWE, The Rugby Championship, Super Rugby, NBA, NFL, PGA Championship, The Masters, and lots more! And all these games are offered for free even without the need to do any subscription. Sports Angel is a one-stop mobile destination to stream Live Sports matches. The app helps you watch Soccer, Racing, Cricket, Basketball, among others. It lets you enjoy a range of top-class sports channels from North America and Europe, such as ESPN, Euro Sport, Sky Sports, MUTV, Fox Sports, etc. It has a very low rate of buffering and offers content in HD. Though Sports Angel app is free, it will nag you with ads. RD Sports is a great app with a quick-loading feature. It lets you watch UEFA Championships, La Liga matches, World Cup, NBA, NFL, NHL, MLB games, Formula 1 Racing and so on your phone for free. Its content is curated in HD quality and allows you to use all other resolution viewings. The app lets you a free account without having to subscribe. RD, designed with lightweight size, offers user-friendly interface as well as simple navigation. Kodi isn’t a live streaming app per se; rather, it is a media centre in which you can add different file repository and watch football matches, TV programs, Movies, etc. To enjoy watching Live Sports on Kodi, it is advised that you install Sports add-ons, such as Sport 365 Live, Supremacy Sport, Joker Sport, and others. Also, there’s a popular Kodi Addon, cCloud IPTV, with over 1400+ channels. And installing this particular add-on on Kodi is extremely easy. This is another free live streaming app with more than 1000 live channels — sports channels, entertainment channels, Kids channels, science channels, etc. — from 15 different countries, such as India, Pakistan, Germany, and so on. RedBox Tv features a separate category of sports, in which there are hundreds of exciting sports matches and programs. It comes with built-in support for every popular media players, such as MX player, Android player, Web Player, 321 player, etc. UK TV Now equally a popularly used Android app for streaming live football matches, live TV, movies, as well as shows on mobile. It offers over 148 different channels from the US, the UK, India, and others. The tool lets you filter shows by Genre, Rating, Type, and Year. UK TV Now app isn’t available for download on the Play Store, but it is on the link below for download. In sum, if you are a lover of sports, especially football, we have provided means of turning your Android smartphone or tab to a mini TV with the impressive litany of live TV apps, highlighted above. These options are not only free but also ideal to use on the go. The post 10 Best Android Apps to Watch Football Match for Free appeared first on PHONECORRIDOR.